A blistering – but clean – start set up Max Verstappen’s Mexican Grand Prix win while Lewis Hamilton brought his Mercedes home in fourth place to wrap up title number five. With a long run down to Turn 1, fireworks were expected at the start of the Mexican GP. The drivers didn’t deliver. However with hotter than expected temperatures, severe tyre wear was also predicted. That was delivered in buckets of marbles. Starting P2 on the grid, Verstappen made a storming getaway while Hamilton stuck his W09 in the middle of a Red Bull sandwich. The Brit had a look at the leading Red Bull but opted to withdraw his front wing from that battle while pole-sitter Daniel Ricciardo was bogged down and forced to fend off the Ferrari of Sebastian Vettel. The only drama is an otherwise clean opening lap was contact between Esteban Ocon and Carlos Sainz that resulted in the Force India pitting for repairs and Fernando Alonso running over his front wing before retiring his MCL33 on lap 5. The opening lap set up the win but not the podium as tyre wear had a say in the outcome of the 71-lap race. Mercedes pitted first, followed by Red Bull and then Ferrari. They came out as they went in: Verstappen; Hamilton; Ricciardo; Vettel, Valtteri Bottas and Kimi Raikkonen. Such was the pace of the frontrunners that midway through the race they were already playing in the traffic, which played into Vettel’s hands. He caught Ricciardo who was handed a brief respite when the VSC came out for Sainz’s stricken Renault. However, a lap after it was removed – so too was Ricciardo’s P3. Vettel’s next target was Hamilton with the Ferrari driver making short work of that as he used DRS to straightline his way alongside his title rival before diving down the inside. It must be said that Hamilton didn’t offer the stiffest of challenges, but he didn’t need to as a P7 on the day would do the trick. The anti-climaxes continued as home town hero Sergio Perez was forced to park his Force India due to a brake issue. Moments later Ocon tangled with Brendon Hartley, both left with damaged cars but still in the race. Hamilton was the second of the frontrunners to come in for a second stop as his tyre wear left him vulnerable to an attack from Ricciardo. After a few laps of defending, Hamilton overshot the corner and had to drive across the grass, losing the position to the Aussie. Evident that Mercedes were pitting Hamilton, Ferrari brought Vettel in before the Brit. Verstappen was the next in – first to first, Bottas was the next off, and then in. Used tyres for Hamilton, new for Verstappen and Vettel. Ricciardo did not pit and for the second time in the race found himself under attack from Vettel. That battle ended in a blown engine for Ricciardo. His eighth DNF in what is proving to be a wretched season. 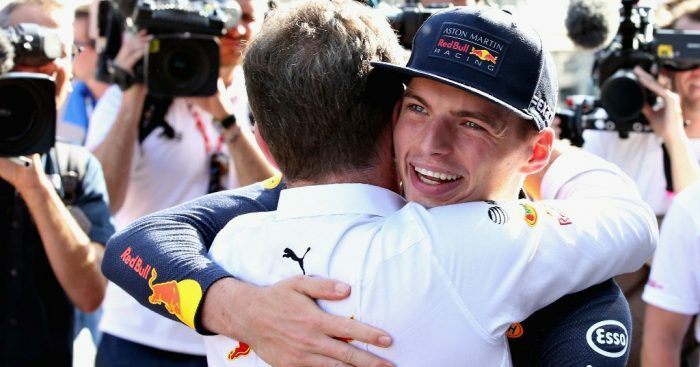 Their squabble did, however, work out well for Verstappen who had a lonely race on his way to the top step of the podium; his second win in Mexico. Vettel was second, joined on the podium by Raikkonen, who did a one-stop race. But it was the man behind them – Hamilton – who made history as he wrapped up his fifth Drivers’ Championship and in doing so became only the third man to reach five. Bottas, who pitted three times, was fifth on the day ahead of Nico Hulkenberg, Charles Leclerc, Stoffel Vandoorne and Marcus Ericsson. Pierre Gasly, who started P20, completed the points.